MTSU's 2014 Homecoming features a 1960s theme that's a throwback to an era of hippies, Woodstock and psychedelic posters and music. Students and alumni are utilizing "RAIDERSTOCK" as the motivating theme for homecoming, which will be held Saturday, with many Homecoming Week activities beforehand. As fans, alumni and students enjoy all the pregame activities, football coach Rick Stockstill and his Blue Raiders will be busy preparing for the 2:30 p.m. Saturday homecoming kickoff against Conference USA opponent UAB in Floyd Stadium. "Planning MTSU's 'Raiderstock' Homecoming 2014 has been such an amazing experience and I can't wait to see everyone's hard work pay off," said October Henson, homecoming director for the Student Government Association. For a full list of student activities, visit http://tinyurl.com/m2hv4yd. Alumni and university friends who recall the 1960s and early 70s era may have a closer connection to the homecoming theme than will students. 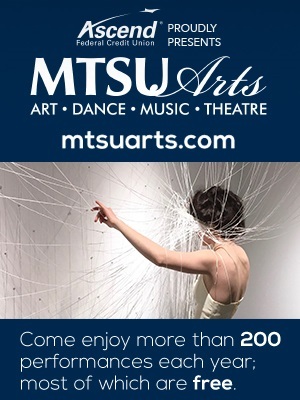 For a full schedule, visit http://www.mtalumni.com or call 615-898-2922 or 800-533-6878.Some events require reservations. "This year's theme of 'Raiderstock' provides a 'groovy' backdrop to the many activities in which Blue Raiders can attend and participate," said Rhonda King, Alumni Relations assistant director. "We invite all 'hippies' to 'give peace a chance' and join in the camaraderie at the Mixer on Middle Parade Watching Party. It will be 'far out, man!'" 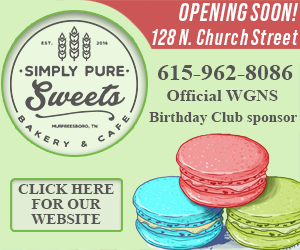 The "party" begins at 9:30 a.m. Saturday at The Alumni House, 2259 Middle Tennessee Blvd. It's one of the prime spots to view the Homecoming Parade, which begins on Maney Avenue, travels down East Main Street before turning onto Middle Tennessee Boulevard and ending at Greenland Drive. 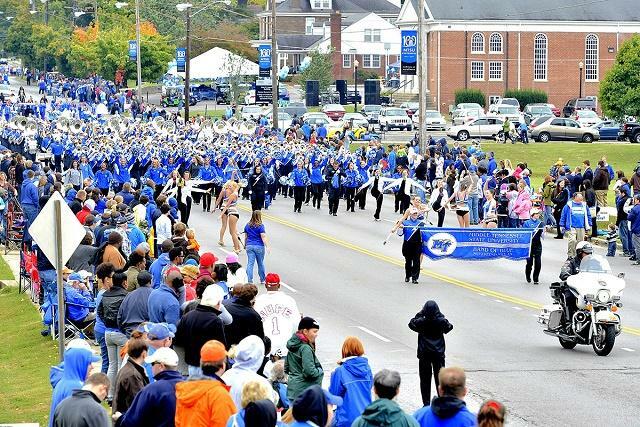 At Mixer, the MTSU Band of Blue will perform two songs, registered Baby Raiders will enter the parade, complimentary souvenir photos can be made and "voice of the Blue Raiders" Chip Walters (Class of '85) and alumna and former television reporter Heather Jensen ('99) will announce the parade. 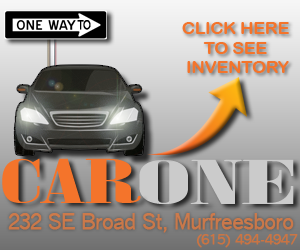 Jenson is now a community relations officer for the Tennessee Department of Transportation. Mixer on Middle, a prelude to the homecoming tailgate lunch, also will feature Phillips Bookstore selling MTSU items; Aspire, a company working with Blue Raider athletics, selling football game tickets for $8 each; a spot to donate canned food items or money for the MTSU Student Food Pantry; and sale of an exclusive long-sleeve royal blue T-shirt with the MTSU seal in white. Music will resonate with the younger generation of current students. 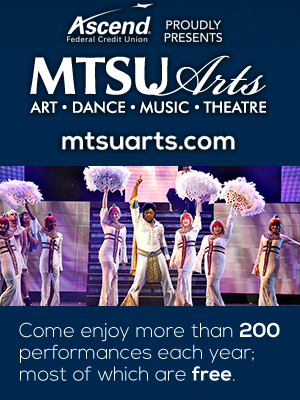 "Homecoming this year is really focused around music and how much talent that MTSU has," Henson said. One of the students' biggest events this year is Raiderstock: Musical Festival from 7 to 10 p.m. Friday, Oct. 17, in the Student Union Commons. Various student bands will perform along with the Andrew Velez Band. Other student events will include the Homecoming Kick-Off from 6 to 9 p.m. Wednesday, Oct. 15, in the Student Union Ballroom, complete with DJ Duggin and a costume contest. Also Wednesday will be the annual Horseshoe Pursuit and a give back day at Blue Coast Burrito. From 5 to 7 p.m. Thursday, Oct. 16, the Chili Cookoff will be held at Campus Recreation Center. In addition to recognizing Distinguished Alumni Vernice "FlyGirl" Armour, America's first African-American female combat pilot, and others Friday and Saturday, other alumni highlights will include alumni homecoming queens and kings helping coronate the 2014 honorees during halftime ceremonies and the celebration of the Class of 1964 with the Golden Raiders.